Static wrinkles and the static component to the combination wrinkles are not caused by muscle movements and thus cannot be eliminated by Botox. However, by injecting dermal fillers under the dermis, the wrinkles can be smoothed out by the plumping effect of these fillers. Dermal fillers work well to treat, for example, the nasolabial folds - the line extending from the nose below the cheeks towards the corners of the mouth. Depending on the direction and the level of depth of the injection of the dermal fillers, the wrinkles and depression in the different areas can be treated. Dermal fillers are biocompatible materials that should be low in allergic reaction risk. The most common type of dermal filler is a derivative of hyaluronic acid. Hyaluronic acid is actually a building block of the skin and occurs naturally in our bodies as a major component of all connective tissue and thus poses a very low risk of allergic reaction. Depending on the molecular crystal size of the hyaluronic acid formulated, the dermal filler effect can last from three months to one year and then biodegrade. 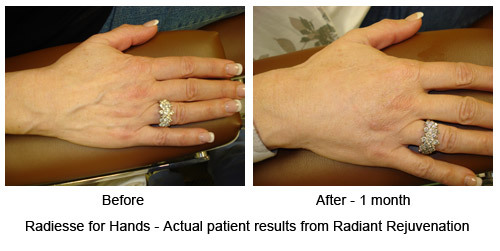 Other dermal fillers, such as calcium hydroxyapatite, can last from one to two years. Other areas of the body, such as the back of the hands and the top of the feet can appear aged by the decrease of subdermal tissue. Dermal fillers can be used to rejuvenate these areas by plumping up the tissue to make the bone, tendon and veins less obvious as when one was younger. Dr. Michael Lau, being a pelvic plastic surgeon, uses dermal fillers also for labia majora rejuvenation and G-shots.